Cohort analysis has lots of practical applications - and can be a powerful tool in marketing decision making. We’ll get into more specific use cases in a bit, but for the time being let’s explore how cohorts can help you hone in on some of your company’s long-term trends in customer retention. Define your cohort groupings. For looking at long-term trends, it is probably best to group your cohorts on a quarterly basis (e.g., all customers who made a first purchase in Q1 of a given year). If you’re more interested in looking at the performance of customers acquired from a particular campaign or channel, it might make more sense to group your customers by week or month. Observe cohort behavior. Many analytics platforms have cohort reports built into them, and if you don’t have one a simple database query can help you group customers by first transaction date and then follow their spend or repeat rate over time. For example, here’s a SQL query you might run in MySQL or another SQL database to look at the quarterly revenue per customer of shoppers who made their first purchase in Q1 2012. Compare different cohorts over time. 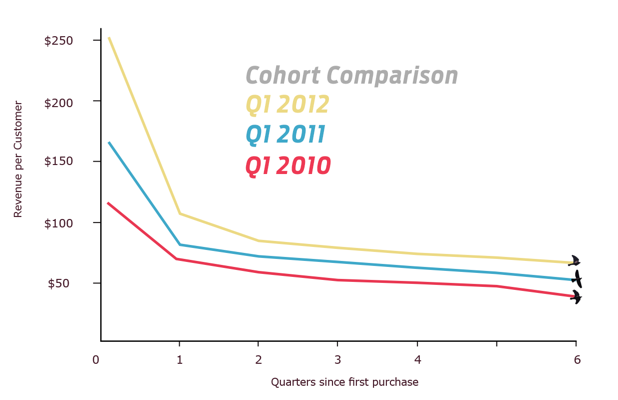 For example, how did your Q1 2012 cohort compare to your Q1 2011 and Q1 2010 cohorts? For example, if you saw a graph like the one below, you would know that you were doing a good job keeping your customers engaged - the average revenue/customer for the Q1 2012 cohort is higher in their second quarter of being customers than that of the Q1 2011 cohort (in their second quarter) or the Q1 2010 cohort (in their second quarter). This workbook lets you plug in historical cohort numbers to simulate a new cohort's future value.